I hate to say it but I'm a little envious of the East Coast for having snow and cold temperatures this time of the year! Perhaps I wouldn't feel this way if I was shoveling snow from my driveway but I guess the grass is always greener on the other side! This time of year in Southern California, the weather is all over the place. It's somewhat cool in the early morning and the night and relatively warm during the day. With all of the fluctuation in temperature, I'm always dressing in layers. 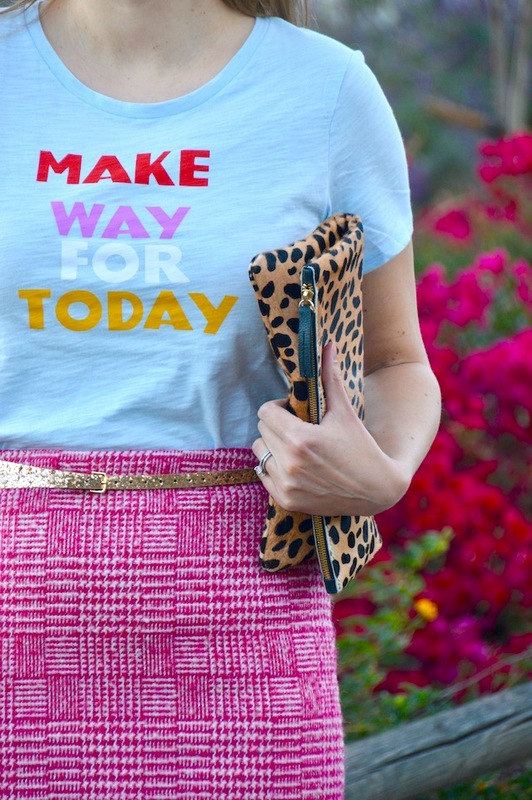 Often, one of my layers of clothing includes a fun statement tee like this one that reads, "Make Way for Today" from Old Navy. Normally, people tend to wear these types of tees in the summer but, as you can see, you can definitely make them work for the cooler winter months too. 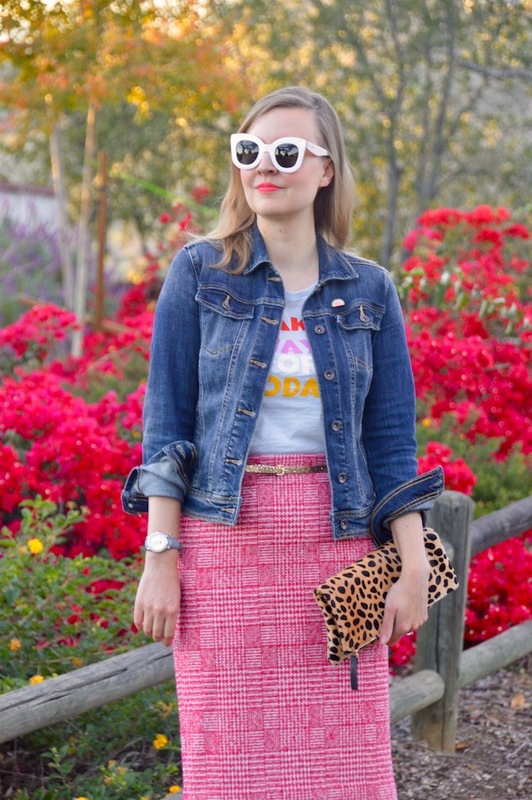 I tried to make this tee more seasonally appropriate by combining it with a wool pencil skirt. This one from J. Crew is a thick wool material but the pink hues also perfectly match the tee! Also, I'm really into the "holiday sparkle" now that the Christmas season is upon us. A little gold sparkle in the form of this gold belt helps to add some holiday shine to the look. Of course, I also added a denim jacket for the layered look I referenced earlier. The denim jacket is my go to accessory all year round. When the temps really drop, however, I wouldn't mind trading in my denim jacket for a nice, warm wool one! Hope that you are having a great week :) It's feeling like summer here, we are in the middle of a heatwave!